As you will soon realize from the pictures posted here, patchwork is a passion of mine and I’d love to share some of my favourite quilts with you. I learned quilting some years ago as I was living in Central Africa. In fact my favourite fabrics are precisely those cheerful, bright, multicolored materials found all over Africa. 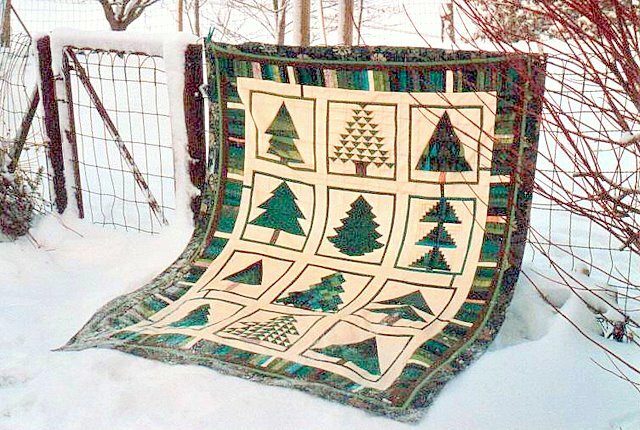 The picture of this particular quilt – 12 trees, 2m20x1m90 – is an exception though. I sewed this sampler for the Year of the Tree and I thought it fitted the Season. I live in the country and walk almost every day to the woods. A forest of pine trees, birches, beeches, rowan trees, oaks… Being around Nature is essential for me and I feel fortunate to live in such a wonderful environment. Nature is inspiring for me, not only for sewing but also for photography, writing, just feeling good. For this particular quilt I used the colours of nature, various greens, browns, ochre, some orange, all shades found in the woods at all seasons. Thanks a lot All things nice, I appreciate your comment. Isa, I too am a quilter. I love the way you chose to display your beautiful quilt on the snow. Nature can be such an inspiration to quilters. Thanks for visiting my blog and dropping a nice comment 🙂 I like your site a lot and I admire your patchwork work – fantastic! I love that quilt. How wonderful that you are able to rev up your creative juices in nature and produce such beautiful things! Thanks again tasteofbeirut, quilting can be so creative, letting go of your imagination as you sew, express yourself with colours and patterns. I started learning about it in Central Africa years ago and never stopped since 🙂 Another passion ! I had to go through you entire blog trying to figure out if I know you, if your paths have crossed at some time in our sojourns. 🙂 I would love to be in the same book club and the same quilt guild as you. Your quilts have a joyful serenity; I can see you put a lot of time and thought into making them, and they show your beautiful soul. (Oops, I guess I am signed in as Intlxpatr instead of WorldQuilter, but you left a comment on my World Quilter blog). Dear WorldQuilter, your words touched me very much, thank you. I am not sure we ever met in reality but when I found your blog I was immediately attracted by your quilts with African fabrics. This is where I started doing patchwork, in Central Africa. I have missed seeing more of your quilting and have been happily surprised to find your message. Quilting is definitely a way of expressing myself while thinking of a person, an experience, a place. Hello again, Isa! It seems we have another thing in common besides photography – quilting! I love it too, but don’t do it as much as I would like to. I did a post about my quilts in April or May of this year. Do you have more photos of yours on the blog? I’d love to see them! Nice to see you here, Karma 🙂 Happy to know you are a quilter too, I will visit your blog and have a look. It´s the same with me, not enough time for sewing, lots of “WIP” that need to be taken care of. Winter months will help… Thanks for your visit ! Hi Karma ! just realize I forgot to tell you that indeed I have more photos of my quilts on the blog, it is under “quilting” at the very bottom of the blog. Hope you will like them. This is so beautiful Isa!!! Can i mention your blog’s name on mine? Ideally I would love to make a quilt, but my talent do not support me here…this is lovely. Im smitten with your work. Hello Rukmini 🙂 it is nice to read your comments, thanks a lot ! I would be happy and honored to have my blog’s name on yours. From your own blog, I think you have talent to see the beauty and variety in many aspects of your daily life. Same with quilting… try with something simple, a little every day and you will wonder how talented you are 🙂 “Log cabin” pattern is a good start. You have such beautiful coloured cotton in your country. Im confident you will thoroughly enjoy this. Your name is the same as the one of a author who wrote “The God of Small Things”, Arundhati Roy. One of my favourite books ever. What a beautiful quilt! I love that you were inspired by the nature you see every day. Lovely. Thanks aguja and sorry for being so late replying to your nice comment. Nature is such a source of inspiration ! Beautiful! I love the natural setting. I really love your quilts – so colorful. Isabelle, that’s a beautiful quilt in your blog banner. The colors are so rich. It looks like a painting. Thank you Amy-Lynn. This quilt is a “Grandmother’s flower garden”, small hexagons sewn by hand. It took me several years to put it together but I enjoyed so much making it ! All scraps, beautiful leftovers from other quilts. Gorgeous quilt, Isa! I found you through Scott Thomas’s blog. I also have been quilting for about 12 years, having learned it from my mother-in-law, who is a professional quilter. I’d LOVE to see some more of what you have, and you’ve inspired me to blog about some of my quilts AND some inspirational photos. My blog is still pretty new, but I hope you’ll visit and enjoy. Hello Tamara and thank you for visiting my blog. I just went to yours and was very touched by your writing. To see more of my quilting, please scroll down to the bottom of my blog. In the “categories” window, click on “quilting”. Most of my quilts are there. Others are on flickr under “isa13”. I am very happy to have met you and hope you will show us your quilts too. Very lovely quilt with a very inviting design. There’s so much warmth and humor in your work! Exposition de courtepointe à Kemi.